It’s nearly half a year ago that I told about my progress with Escape Pod and I can again report that I am working my way to the top of the list. The top of the list is obviously the newest story on Escape Pod. 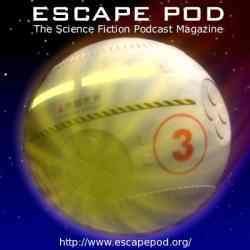 In case you don’t know about this podcast – Steve Eley publishes a science fiction story each and every week and I try to miss none. Thanks to pod-casting and mp3 players I am succeeding. The only problem is that when I don’t have to drive much, the stories accumulate on my mp3-player/cell-phone. Just the other day I worked on a story from late December – OK – work might not be quite the right word. This story, City Talkers by Mur Lafferty fascinated me because it goes very nicely in the direction I am going. I am not much of a City Talker, which is something like a horse whisperer, but for cities – not the people in the city, but the city him or herself, but I’m a pretty good computer whisperer. This entry was posted in Audio, Stories and tagged podcast, science fiction, steve eley on February 2, 2008 by Merlin Silk.